Sleepwish duvet cover sets are anever-changing collective of talented artists who churn out fresh,statement-making pieces. What separates Sleepwish Bedding from thecompetition? Perfect weight, NOT make your own duvetfluffy. STURDY zipper makes it so easy to put inthe comforter. Sufficient ties inside to KEEP thecomforter from slipping around. Zipper and seams are finished perfectlywith NO tale threads hanging. Microfiber bedding is a reasonably thinmaterial, BUT it's also soft, silky and durable. 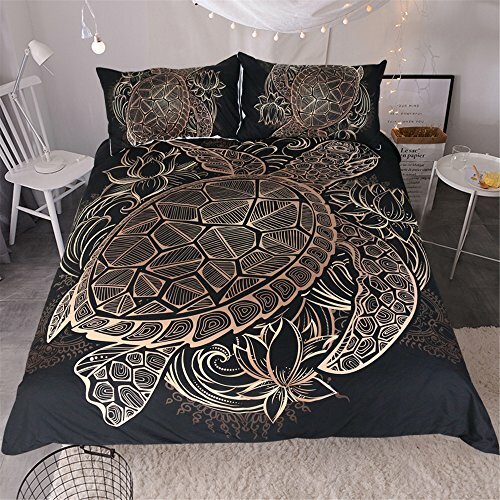 Twin Size: 1*Duvet Cover 68"x86"& 2*Pillow shams 20"x26"
Full Size: 1*Duvet Cover 80"x90"& 2*Pillow shams 20"x26"
Queen Size: 1*Duvet Cover 90"x90"& 2*Pillow shams 20"x36"
King Size: 1*Duvet Cover 104"x90"& 2*Pillow shams 20"x36"
Note: If there is a problem with yourorder, in any way, please contact us. Log into your account at Amazon, under "Your Orders" select "ContactSeller" for this order. AESTHETIC DESIGN: The background is a black, simple, abstract floral pattern. Great for anyone who loves cartoon animals, cute turtles, floral patterns, the color gold, or anything cutesy.